A former Fox News host has accused President Donald Trump of attempting to kiss her on the lips around the same time he married First Lady Melania Trump. Juliet Huddy claims that Trump attempted to kiss her while the two were in an elevator back at Trump Tower in New York City in 2005, according to Page Six. Huddy, who reportedly received a settlement after filing a complaint against disgraced former Fox News anchor Bill O'Reilly, said the incident happened after the real estate mogul took her to lunch. The WABC Radio show host made the revelation during an interview on 'Mornin!!! with Bill Schulz' on compoundmedia.com, adding that she rebuffed his advances. 'He took me for lunch at Trump Tower, just us two,' Huddy told Shulz. 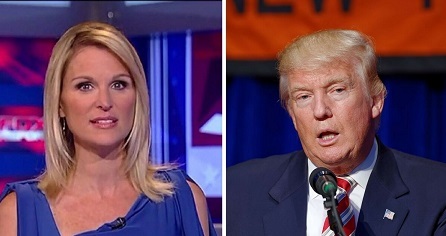 Years later, Trump appeared on Huddy's early morning talk show on Fox affiliate WNYW, where she said he admitted, off camera, to the incident. 'Now I have matured I think I would say, 'Woah, no,' but at the time I was younger and I was a little shocked. I thought maybe he didn't mean to do it, but I was kind of making excuses. The elevator incident and the lunch was 2005 or 2006,' she added. Trump married Melania in January 2005. Huddy, who was former Fox News president Roger Ailes' goddaughter before he died earlier this year, left the outlet shortly after receiving a reported six-figure settlement from the station's parent company, 21st Century Fox. » Rihanna Is The Cause Of Jay-z And Beyonce's Sister Fight In The Elevator.